This piece is part of a series of tango-jazz compositions. Each one explores a particular quality of the tango. 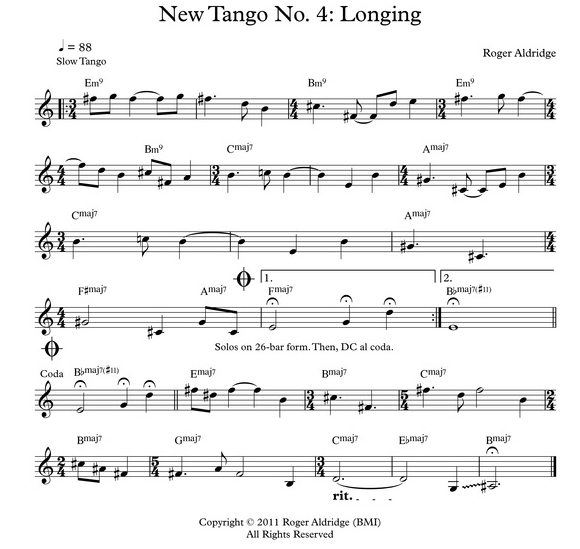 Number 4 is about feelings of longing -- the essence of the tango, as I was told by a friend who is deeply into tango dancing. Recorded by Amy Leonard, violin; Jeff Knoettner, keyboards; E. Shawn Qaissaunee, guitar; and Peter McCarthy, bass. New Tango No. 4 is an unusual tango in how it is predominatly in 3/4 with measures of 4/4 (and other meters) inserted for shifting time. The music is rich in harmonic color and has a deep level of feeling. While this tango is about longing, the harmonic shift at the end expresses a sense of hope.